The Cross Needs a Voice! | Lift Jesus' Cross! Last weekend, my daughter introduced us to a teenager who was homeless. Dillon (not his real name) has a job, but not a car or a home. He saves what little money he makes washing dishes at a restaurant to survive. He buys his own food (the restaurant gives him 20% off their food) and pays his friends gas money to take him to work. He said, “I sleep couch to couch.” So we gave him our couch Saturday night. I mean, what would Jesus do? Quote John 3:16 and send him on his way? I don’t think so. My daughter had a great idea. In mercy, she offered to pay Dillon to help her dad haul wood. The money helped Dillon and her dad sure needed the help. It became obvious that Dillon is about as lost as a person can be. 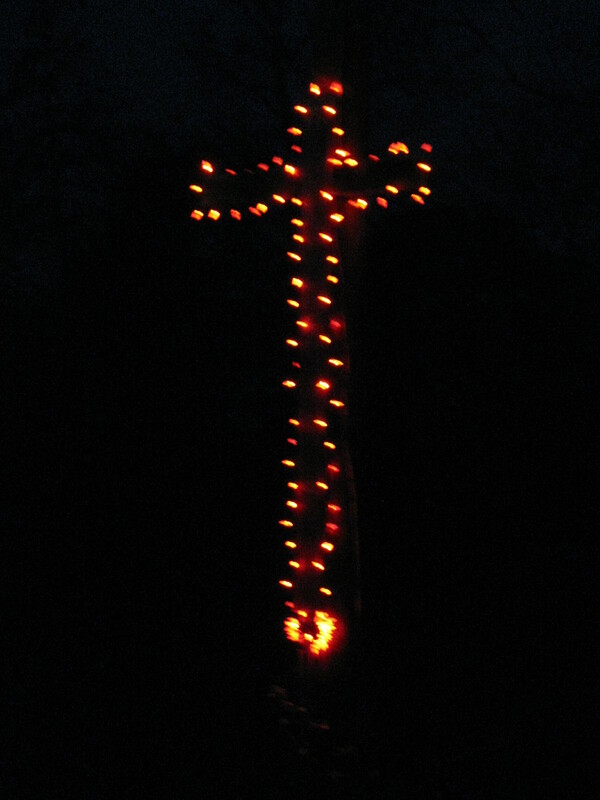 As he helped my husband haul wood back and forth from the woods at the edge of our yard to the house where we stack the firewood, I wondered what he thought of the lighted cross erected high on a telephone pole in our backyard. Later that evening, after he got off work, a friend dropped Dillon off at our home. The cross was surrounded by red lights (pictured here), shining brightly across from the back door where he came in. That night he slept in a sleeping bag on our couch and across from the couch are the sliding glass doors, no curtains, so the cross can be seen shining brightly in the night. Sunday morning we shared our shower, shelter, and food with Dillon and then shared the gospel with him. He’d never heard of King David and only knew that Jesus was tortured because he watched the movie, The Passion, several years ago. I asked, “Dillon, you saw the cross in our back yard, right?” I expected him to nod. Instead he looked at us quizzically and said, “I don’t know?” We pointed to the cross and he looked out the window. For the FIRST TIME Dillon saw the cross. I was shocked. How could he haul wood right past that telephone pole and not see it? How could Dillon drive up in the black of night with his friend and walk in the back door and not see that lighted cross in our back yard? And most of all, how could sleep on our couch and never see the lights of that cross? Of course, we explained that getting saved is like that. We didn’t do anything to earn it but all we can do is receive the gift Jesus gave to us when he died on the cross. But that’s okay. As always, God had a plan. Tonight Dillon will not sleep on a random couch. We’ve helped him to get established in a home for the next two months while he saves enough money to launch out on his own. Just this morning he texted me and we’re sharing Bible verses back and forth. He’s eager to visit again and help Scott haul wood and he wants to learn to play a little piano. Dillon is one teenager among many today who are lost and really don’t recognize the cross or its meaning. The cross has the power to turn their lives around, but we need to give that cross a voice. This entry was posted in The Cross and the Christian and tagged American, Bible, cross, father, Gospel, heritage, homeless, Lift up the Cross, lost, mother, multitudes, patriot, politics, preach, preacher, teenager, United States, Valley of Decision, vision, vote, voting. Bookmark the permalink. 3 Responses to The Cross Needs a Voice! Another excellent post, Hope. It is so important to get this message out, so thank you for writing and sharing it!